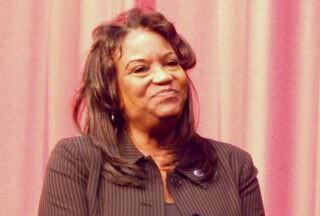 Michelle King on Thursday was named Superintendent of the Year. 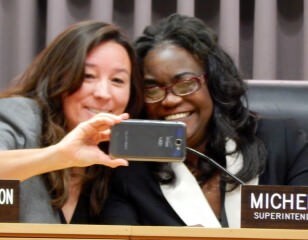 Tuesday’s election of two pro-reform school board members could mean a whole new set of challenges for LA Unified Superintendent Michelle King. The board will shift in July from a pro-union majority to one backed by charter school supporters, and some observers think that could present difficulties for King, as the superintendent is hired and fired by the school board. But interviews with board members and other observers indicate King’s job is safe. King hasn’t been a “lightning rod for controversy” and is generally well-liked and well-regarded, said Raphael Sonenshein, executive director of the Pat Brown Institute for Public Affairs at Cal State LA. He noted, however, that LA Unified has a history of turnover at the top when a new board majority is elected. “You could also argue they might keep her on as a statement that this isn’t the end of the world,” Sonenshein said. He said her future will likely depend on the recommendations she and her administration will make regarding independent charter schools and sharing district facilities with those schools. Mónica Ratliff takes a selfie with King. From her first days after being named superintendent, King has sought to heal the “us vs. them” division between district schools and charters and has stressed that “they’re all public school students” and she is responsible for all of them. She has worked collaboratively with Myrna Castrejón of Great Public Schools Now, which seeks to expand charters as well as replicate successful district schools. But the bitter campaigns this spring has likely exacerbated deep divisions within the district, mostly between charter school backers and the teacher union, which has sought to limit the growth of charters, where many teachers are not in unions. King will likely have to work even harder at healing rifts in the district, particularly as she will be leading the district’s upcoming labor negotiations, as 11 contracts expire this summer. This week’s election also has left many teachers wary, and they have taken to social media expressing anger and fear about how they might fare under the new board. As board President Steve Zimmer delivered his concession speech Tuesday night, there were many LA Unified teachers with tears in their eyes who were worried about their future with the district. King’s 33-year tenure at LA Unified means she worked for the district since before charters came on the scene, as well as during other periods when there was a pro-reform majority on the board, such as in 1999 and in 2010. With Tuesday’s election of Nick Melvoin and Kelly Gonez to the board, García and Ref Rodriguez, a charter school founder who was elected to the board two years ago, are now in a pro-reform, 4-3 majority. García and Rodriguez, along with the other five members currently on the board, voted unanimously to elevate King to superintendent after an exhaustive nationwide search. 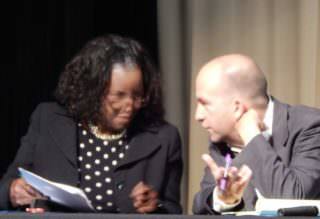 However, when King delivered her vision for the district, the board declined to support it with a vote. Although Melvoin and Gonez have been critical of the district, they haven’t specifically criticized King. During his campaign, Melvoin criticized LA Unified’s high turnover of superintendents and pointed to that as an example of how the board has not shown leadership. Gonez stated that she was happy with King’s leadership, although she said she would like to work with the superintendent to improve her strategic plan. “I do think it would be great if she took more of a bold and visionary stance,” Gonez said. Outgoing board member Mónica Ratliff, who endorsed Gonez, said she doesn’t think King’s job is in jeopardy. Zimmer said he believes in King’s collaborative leadership that she has shown with the very diverse board during her first 18 months on the job. “Dr. King is one of the best system leaders in our nation,” he said in a statement Thursday congratulating her for being named National Superintendent of the Year.